Caesarius (c.470-543) was bishop of Arles for the last 40 years of his life. One of his most wide-ranging achievements was to draw up the first set of guidelines specifically tailored to govern the conduct of nunneries; his own sister was abbess of a community of 200 women. He was especially famous as a preacher, and the present manuscript contains a number of his sermons. At the end of the main text is an added list of properties owned by Wallingford Priory, on the Thames between Didcot and Henley, in Berkshire: the manuscript therefore belonged to the priory in the Middle Ages. 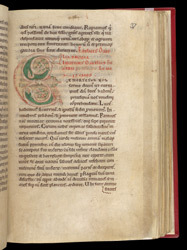 This initial 'E' marks the end of ten sermons by Caesarius, and introduces the start of eight by Eusebius ( a 3rd- to 4th-century bishop of Caesaria). A later hand has added the running-heading 'Eusebii' in the upper margin, to help readers find their way around the texts in the volume.